Readers who love smart thrillers won’t want to miss The Chosen Ones – Thy Will Be Done, written by author Margery Miller Mon-Dragon. Set in the high-intensity and politically diverse area of Washington, D.C., this clever new release hits the mark for suspense, action and social commentary – exploring the question of why we seem to be failing to engage in reasonable advances in medicine for all citizens. Readers who love smart thrillers won’t want to miss The Chosen Ones – Thy Will Be Done, written by author Margery Miller Mon-Dragon. Set in the high-intensity and politically diverse area of Washington, D.C., this clever new release hits the mark for suspense, action and social commentary – exploring the question of why we seem to be failing to engage in reasonable advances in medicine for all citizens. Within this book the reader will find themselves dealing with modern medicine and the issues of genetic restructuring, donor procurement, terminal illness and death and dying in our society. 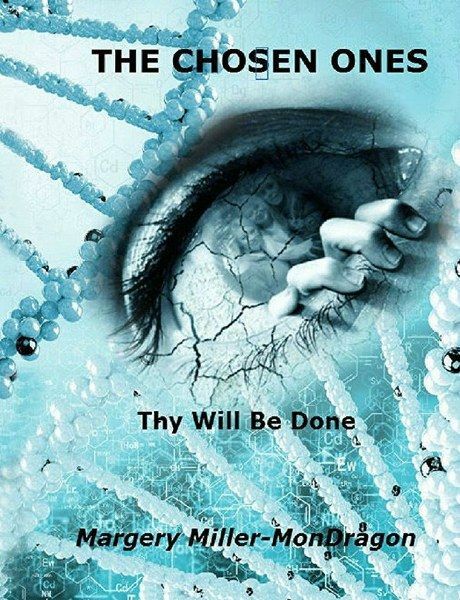 The Chosen Ones – Thy Will Be Done, is a riveting thriller about a woman’s fight to uncover the genetic code to life itself and to bring to the world The Book of Man. Mara McClurg has been missing for five years. She leaves behind two daughters who have grown into young women beneath a blanket of lies and secrecy. When the US government discovers that a private sector research facility (GenTech) has broken the genetic code, Mara is sent to recover the book of man. “It sure the hell is,” he replied. “Get the girls and c’mon down.” The girls were already wearily trailing behind her. “Thank you very much,” said Stokes. Jaye joined her sister in the AM bashing. “Yeah, it’s really getting kind of thick around here.” Mimi continued to hold her head with her elbow firmly planted on the table. Her eyes were still half closed. Carol was becoming agitated with her. “No, I won’t! Aunt Carol,” she moaned. “That’s a tale I’ve been waiting to hear for a very long, time.” She shook her head. The long blonde hair blew from her face as if a strong wind had hit. Then she jumped from the table and began to do jumping jacks. Fifty pushups followed. All marveled at Mimi’s strength and resilience. Stokes couldn’t have made a finer breakfast. Scrambled eggs, sausage, bacon and English muffins graced the table. “You’re welcome Carol, I enjoyed it. It’s a real nice change for me too,” said Stokes. “Yes,” she thought quietly to herself, “especially considering what lies ahead of us today.” The girls were preoccupied. Who wouldn’t be when faced with their situation? “C’mon,” said Stokes. “Don’t give Carol trouble this morning. Let’s just move right along so we can get started. I don’t have much time to spend here and I need every minute to count.” A silence swept the room. The sound of dishes loudly shrieked against each other. Stokes placed himself comfortably on the sofa next to Carol. It was nearly 1:00 PM. Everyone perched in the living room waiting D-day. “God!” said Stokes. “This is what we’ve all been waiting for. It’s not so bad. So don’t look so doomed. Now, once upon a time,” he teased. “Oh Stokes!” shouted Mimi. “Let’s get real”. “It’s Ok,” said Jaye. “It’s Ok Stokes. I understand. Mimi and I aren’t babies anymore. We’re capable of comprehending the intensity of emotion. I’m glad you loved my mother. Maybe all of our lives would be different today if you had married her.” Silence overcame them, like a swift blanket of cold arctic air. It was plain to see he loved them, thought Carol. He probably would have been a wonderful father. “Yeah!” said Stokes. “She’s right. We’ll start with the plane trip and the escape from Pittsburgh.” “Then we can play those tapes Mara left with me for safe keeping.” Both girls looked at him with a perplexing eye. “We weren’t aware of any tapes,” said Jaye. Stokes disappeared from the living room. It wasn’t long before he returned with a steel box. He sat down in his previous spot and began touching it in a strange and methodical sequence. “I hope it’s not rigged to blow,” he said. Then he laughed aloud and went on to say, “I don’t think your mother would endanger you that way.” After four unique sequences, the tumblers clicked and the unusual steel box opened. Inside were sixteen videotapes. The girls jumped from their seats to handle each one. They were numbered in sequence and on the bottom of the box there was a note. Mrs. Miller-Mondragon's CV is a good start to convince the readers that The Chosen Ones has what a medical thriller needs. The cover is stunning and I enjoy this genre. lways a good thing to discover a new author too. I just love your excerpt. Cool use of background helixes! The icy cover looks nice. The genomic sequencing story looks interesting. The cover looks very dark but powerful.A strong woman.